Bane NOR is a state-owned company responsible for the Norwegian national railway infrastructure. It owns most railway lines, platforms, waiting areas and stations, stretching 4 209 kilometres across the country. The company is responsible for the planning, development, administration, operation and maintenance of the national railway network. Its responsibilities also include traffic management and developing more efficient solutions for its operations. It employs approximately 4000 employees, divided between five divisions with different responsibilities. As a result, Bane NOR who operates the railway needs to be informed quickly of any land subsidence or other occurrences that affect their tracks. Furthermore, the method needs to be cheap enough to cover the entire lengths of Norway efficiently. The position of the railway track is subject to change due to geological changes in the landscape, temperature variations, and the physical forces of train traffic. Over time, these changes may cause reduced comfort for passengers or danger for trains in extreme situations. Track geometry is measured periodically up to six times per year. This is done with a unique measuring car (ROGER 1000) with optical lasers, gyroscopes, inclinometers, accelerometers, and cameras. The position of ROGER 1000 along the track is measured both by an odometer and satellite navigation. The instruments are used to detect anomalies in the shape or position of the track. Observations are then logged together with their respective geo-positions using satellite navigation. Thus, the workforce tasked with inspecting and repairing the railway knows where to go. Precise measurements are made manually by inspectors. Traditionally, these measurements have been done with reference to fixed points on the ground within line-of-sight of the railway. However, installing reference points along more than 4 000 kilometres of railway is very expensive. This is especially true in Norway where large parts of the railway are without electricity lines. Building a supportive infrastructure to support all areas would cost hundreds of millions. In 2015 Bane NOR therefore began testing the satellite based Real Time Kinematic (RTK) method for tracking track positioning. This technique makes use of reference points from base stations for satellite signals rather than metal bolts in rock or concrete. These stations are run by the Norwegian mapping agency, reducing the need for infrastructure investments. Thanks to satellite navigation, Bane NOR can more efficiently deploy its maintenance workforce. This helps reduce costs while also making the workflow more convenient. The new method relying on RTK has so far provided reliable results with a standard deviation within the present technical requirements. The method is also cheaper for the administration to run and removes the need for large investments in areas without an electricity grid. Lastly, the new technique has also proved to be more reliable. 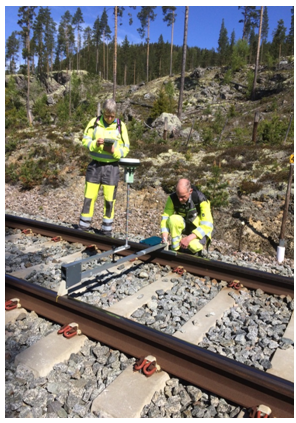 Since the alternative measuring units are installed on trees or on the ground along the railway, geological changes may alter their relative position to the railway. These measuring units will then incorrectly report a change of the railway itself, when it is instead the measuring units that have moved. With thousands of such sensors along the railway, the likelihood of an error is quite large. The satellite based solution solves this problem.